2014 "Drifting from Town to Town" nominated for a Blues Music Award in the category Traditional Blues Album of the Year. Forty years ago, Barrelhouse Chuck was a student of Chicago blues piano. But today Barrelhouse Chuck is a master in his own right, and he is carrying on the tradition that he learned directly from Little Brother Montgomery, Pinetop Perkins, Sunnyland Slim, Detroit Junior, and others. Barrelhouse Chuck melds these disparate styles into his own and no other Chicago piano player has been able to do this and have the same pedigree. 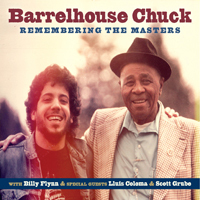 On this disc Barrelhouse Chuck is joined by his long-time collaborator Billy Flynn, who is one of the best blues guitarists practicing his craft today, Lluis Coloma, who is Europe’s leading exponent of blues and boogie woogie piano, and Scott Grube, who plays traditional pre-war blues piano in Chicago. "Driftin' From Town To Town"
In 2006, esteemed jazz critic Nat Hentoff featured Barrelhouse Chuck in the Wall Street Journal, where he reviewed “Got My Eyes On You” and praised Chuck’s commitment to the Chicago blues piano tradition. 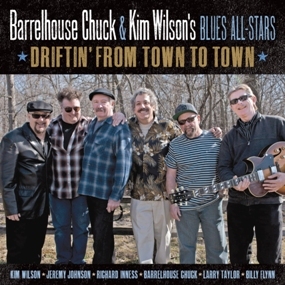 On this disc, Barrelhouse Chuck and Kim Wilson continue building their strong musical bond with one another and show why they are the premier Chicago blues artists. With the help of veterans, and stars in their own right, Larry Taylor, Richard Inness, Billy Flynn, Jeremy Johnson, and Sax Gordon, this disc is absolutely must listening for experienced and new listeners of Chicago blues. "Got My Eyes On You "
Barrelhouse Chuck leads an all-star blues band which includes premier harp player and Fabulous Thunderbird’s member Kim Wilson; long-time Muddy Waters rhythm section members Willie “Big Eyes” Smith on drums and Calvin “Fuzz” Jones on bass; and talented guitarists Joel Foy and Eddie Taylor, Jr. This band smokes as Chuck pays tribute to his mentors and heroes Sunnyland Slim, Little Brother Montgomery, Floyd Jones, Detroit Jr., Memphis Slim, Big Moose Walker, Smokey Smothers, Eddie Taylor, and Muddy Waters. Barrelhouse Chuck’s music continues the Chicago blues piano tradition! "Classic jazz, blues and boogie from the South Side of Chicago will flourish so long as Barrelhouse Chuck is at work. In his newest release, a welcome solo outing, the singer-pianist asserts himself as a veritable one-man-band. Listen to his exquisitely ornamented piano lines on Leroy Carr's My Own Lonesome Blues, rolling boogie rhythms on Carr's Mean Mistreater Mama and all-over-the-keys virtuosity on Sunnyland Slim's Johnson Machine Gun, and it's clear that Barrelhouse Chuck has become an importatnt advocate for historic repertoire. At the same time, he builds on theachievements of giants with the beauty of his keyboard touch and melancholy tone of his voice." "It isn't often that four Chicago piano virtuosos convene for a marathon recording session, but this one must have been a riot, judging by the sheer fervor of the performances. Each artist sounds utterly unlike the rest, with Barrelhouse Chuck laying down relentless boogie rhythms, Detroit Junior accompanying his fat chords with moans and cries, Pinetop Perkins luxuriating in the unbelievably slow and sultry tempos and Erwin Helfer ripping through blues boogie, and jazz numbers at a breakneck pace. Together, these great Chicago originals play down-home music that's about as unvarnished as it gets." The Sirens Records has released compact discs by the best pianists in the world. Some of the legendary blues pianists we've recorded include Erwin Helfer, Pinetop Perkins, Detroit Junior,and Barrelhouse Chuck. In gospel music, we've recorded keyboard masters such as Jessy Dixon, Geraldine Gay, Nash Shaffer Jr., and Reverend Dwayne R. Mason. In jazz keyboards, we have recorded Earma Thompson, bebop legend, and Chris Foreman, playing acoustic piano while accompanying Kimberly Gordon. In addition, we've recorded talented Chicago vocalists including Katherine Davis (blue and jazz), Kimberly Gordon (jazz), Sydne Evans (gospel), and Donald Gay (gospel). The Sirens also pays tribute to the master pianists of previous eras including Sunnyland Slim, Blind John Davis, Willie Mabon, Speckled Red, Billie Pierce, and more.